4 required for replication. These technologies enable you to experience the best possible level of protection for the available bandwidth while dramatically reducing WAN costs particularly over long distances. Similarly, RecoverPoint requires less storage space than alternate technologies since it only tracks changes made during the customer-specified, recovery-point-objective interval. It also leverages journal compression to use less disk storage then other solutions when storing the tracked changes, resulting in an even greater reduction in storage costs. In addition, RecoverPoint has a snapshot consolidation policy that lets users decide how long to retain every write captured and at what point to consolidate their changes which also optimizes storage space and as a result, reduces the amount of storage necessary to retain snapshots. INSTANT ACCESS TO PROTECTED DATA RecoverPoint enables application data to be accessed at a point in time using DVR-like technology to select intelligent time- or application-specific bookmarks. Application data at the selected point in time is instantly recovered and can be immediately read and written by the host. 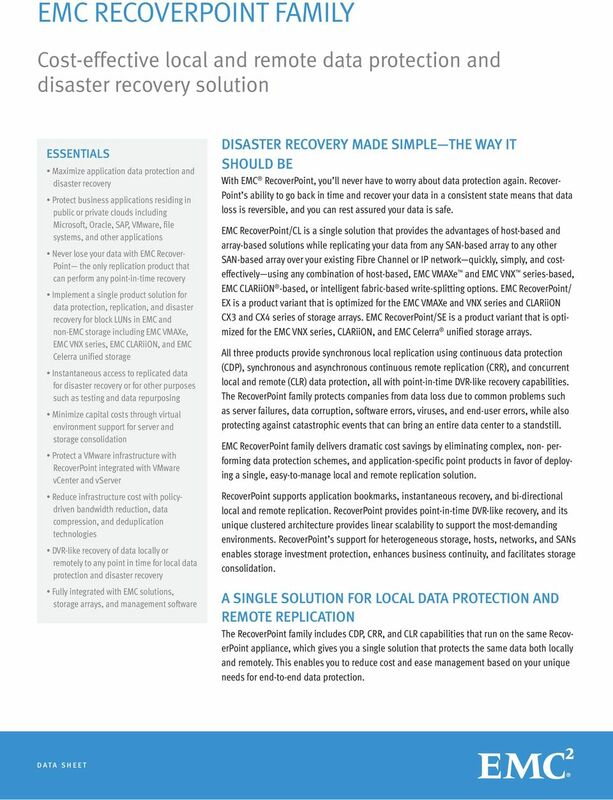 RecoverPoint enables read/write access to the recovered data without disturbing the replication process. This capability can be used to offload backups, enable live application testing, support on-demand recovery, migrate data, and for many other valuable data processing purposes. RecoverPoint also supports multiple transaction-consistent recovery points each indexed to a specific point in time. 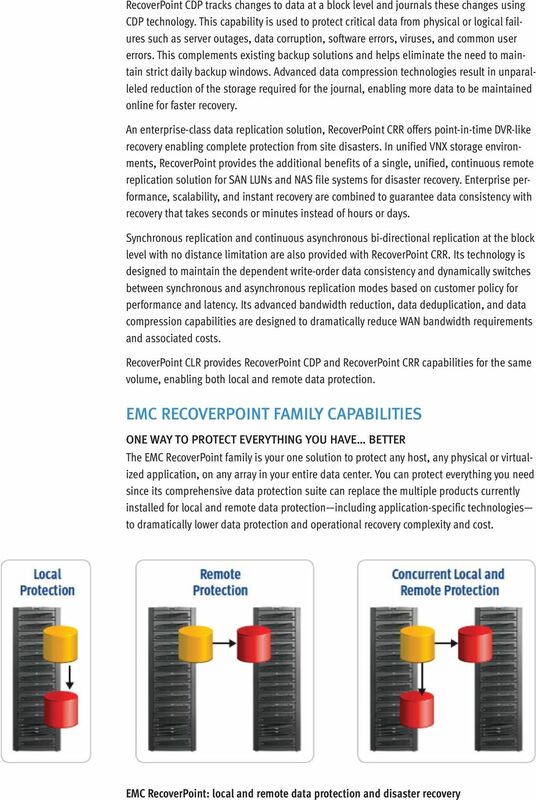 EXTENSIBLE APPLICATION INTEGRATION By providing seamless integration with physical or virtualized business applications from Microsoft, Oracle, SAP, and others, RecoverPoint facilitates intelligent protection and recovery, dramatically reducing application recovery time and eliminating data loss. RecoverPoint monitors application and environment events during the replication process. Important events that occur at the application, host, network, or storage level are logged, and rootcause analysis is performed to analyze any resultant process failures. RecoverPoint offers a feature-rich programmable interface that enables customers to generate customized bookmarks for their selected business process applications, which allows those applications to be quickly recovered back to an application-consistent point in time. 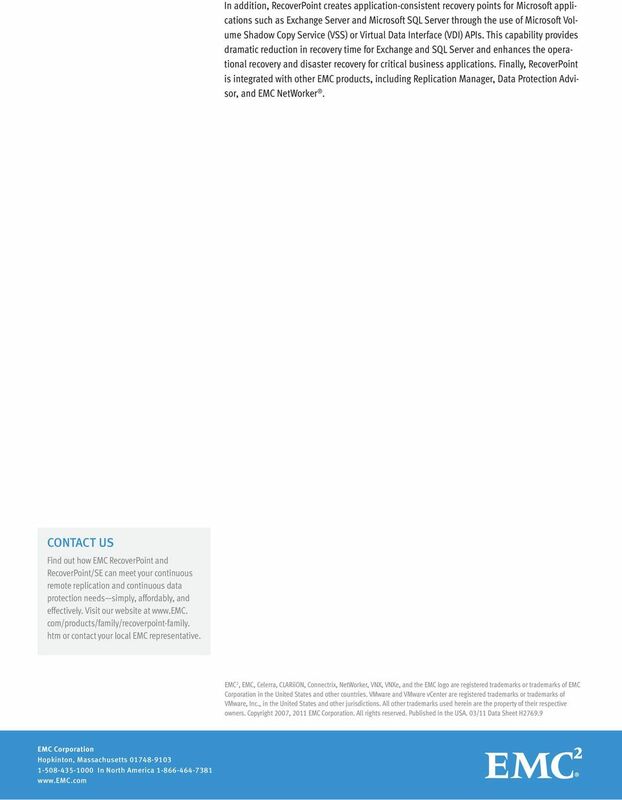 VNX Data Protection: Simple File Recovery to full-site DR readiness session. Copyright 2011 EMC Corporation. All rights reserved. EMC VNX FAMILY. Next-generation unified storage, optimized for virtualized applications. THE VNXe SERIES SIMPLE, EFFICIENT, AND AFFORDABLE.